I would never have imagined the results would be this great! I would highly recommend Dr. Khokhar to anyont interested!! From the initial consultation to the final follow-up visit, the level of service and attentiveness was unsurpassed. Your staff could not have been any more accomodating in scheduling my visits. Throughout each step of the process, Ifelt taken care of and appreciated. Unlike other lasik centres this was the only one where I was able to meet with the doctor during the intial consultation. I never once felt pressurised to make a decision. Rather, Dr. Khokhar patiently answered all of my questions and alleviated all of my concerns. First, I would like to say thank you so much! I have have been wearing glasses for eleven years and contacts for five. The “new” set of eyes you have given me is AMAZING! Once I decided to ask you for the opportunity to have the corrective surgery, you Dr. Khokhar and your staff treated me with the utmost respect and also gave me the attention I have never experienced at a doctors office. I have certainly enjoyed my experience at the Sugarland Eye & Laser Center. Dr. Khokhar and his staff are kind, helpful and provided a sense of warmth for me while I was there (a much needed comfort because I was nervous). Once again, THANK YOU ALL VERY MUCH for allowing me to experience my life in a new vision. I appreciate every little thing provided for me as a patient. I am a 39 year old man who has been in glasses since 1985. On Friday June 24, 2011 I spent about 15 minutes at [Houston LASIK & Eye] and completely changes my life. I have always heard people say that getting lasik surgery was the best money they’ve ever spent and I am now one of the converted masses. It is hard to explain how much things have changed for me in my first week sans glasses or contacts, suffice to say that I am absolutely thrilled and amazed. I liken it to getting a cut or bruise on a random part of your body. You never knew how much you used it or touched it until you hurt it. Good part is this is exactly the opposite. I got so used to depending on corrective lenses that I am now noticing every little thing that I don’t need them for anymore. FREEDOM!!! The staff at [Houston LASIK & Eye] could not have been more knowledgeable, kind of helpful. 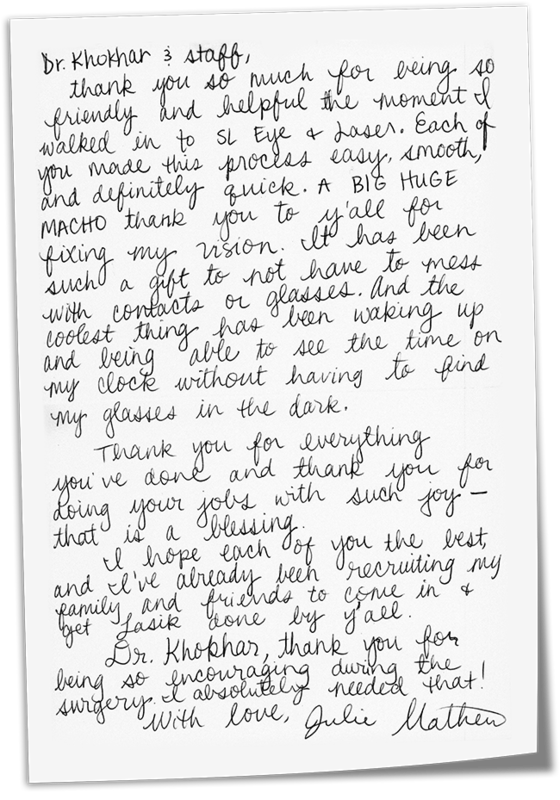 From the receptionist, to Lindsay, the LASIK coordinator, to Dr. Khokhar and Dr. Heaney, I experienced top-notch customer service and patient care. The process itself was quick and painless, literally. I will recommend the procedure and this clinic specifically to everyone with whom the conversation of LASIK surgery comes up for the rest of my life. I cannot thank you all enough. My first step involded calling several offices. [Houston LASIK & Eye] gave me the best information over the phone and scheduled an informative meeting right away. In no time, the day for the surgery arrived. After a handful of minutes in surgery, I was elated to actually realize a dream of being able to see without hunting for my glasses. Before surgery, everything more than a foot had been blurry. Now everything is crystal clear. I am especially happy with the follow up appointments where I learned my vision is now 20/20 or slightly better. What a life altering surgery! I met Dr. Khokhar and started to talk with him about laser vision correction. I never thought I would really go through with it. I spoke with him a few times and was inspired by his confidence. I could tell he was genuinely concerned about my personal outcome. Not only is he well-trained on the latest in technology, he is turned to for some of the most difficult cases in the region. I was impressed that the technology he uses is approved for NASA’s astronauts and the Air Force’s fighter pilots. Then Dr. Khokhar told me that her personally takes care of his patients before, during and after surgery. That’s when I decided to see better with laser vision correction with Dr. Khokhar as my surgeon. The experience I had with Houston LASIK & Eye was phenomenal. The level of personalized service was amazing. As I met various members of Dr. Khokhar’s laser vision correction team, I could see that I was going to be in the best of hands. On the day of the surgery, every member of the team was attending to my anxieties and walked me through the procedure. Laser was applied to my eyes for about 30 seconds. In about 15 minutes, I was walking out after the most painless procedure seeing without glasses as I had never done before! The next day, I was seeing 20/15 and comfortably returned back to work. To anyone considering laser vision correction laser vision correction, I chose Dr. Khokhar out of all the LASIK surgeons in Houston. This is a decision I have not regretted. Every day, I help others by reading their imaging studies, and I do this in a way I have never done before… without glasses. Thank you Dr. Khokhar. Today I went for my free LASIK screening and was surprised at the VIP attention I received. I met the staff of Houston LASIK & Eye, the laser vision coordinator, and even the surgeon himself! Dr. Khokhar made sure I understood what LASIK was and why I was a good candidate. He also let me know what to realistically expect from LASIK. I could tell that Dr. Khokhar really cared that I was comfortable about the whole thing. He really got to know me! Before I left, I knew I would wanted the level of unsurpassed technology and personalized service that only Houston LASIK & Eye can provide. After visiting the laser center, I went to see Dr. Khokhar for my preoperative appointment. The staff prepared me for the day of the surgery and let me know everything to expect. Dr. Khokhar answered all of my remaining questions. The appointment was long. The surgeon told me that my eyes were checked by many different technologies and by many different methods to ensure that I have any exceptional result. It really added another level of comfort for me to see this attention to detail. Today I had my LASIK. I can’t believe how fast and easy it was! Dr. Khokhar has me take some medications to keep me “relaxed.” In the tranquility room, I relaxed on a recliner and almost fell asleep! In the laser suite, Dr. Khokhar let me know everything he was doing and kept telling me how wonderful everything was going. The laser must have last about 20 seconds. I was out of there in 10 minutes and never felt a thing. A took a nap when I got home and when I woke up . . . WOW! It wasn’t perfect but I can see things are starting to clear up really fast. I woke up today and reached for my eyeglasses. But then I realized I did not need them anymore! I could see the alarm clock, the tree outside my window, and my whole family clearly without any glasses or contacts. I got ready just looking at all the details that I could now see. I hoped into the car to drive to see Dr. Khokhar for my postop appointment. No glasses! Dr. Khokhar said I was seeing 20/20 in less than 24 hours! I should have had LASIK a long time a go. I can’t believe I waited this long.